Death, like love, has many subtle and varied layers. Lost spirit Tamsin West learned that the hard way after a group of Soul Eaters sliced up her soul like birthday cake and doomed her to dust. Only dust is not really the end. Spiritually speaking. By finding a body at the point of death, Tamsin can live again. Live to hunt her killers. There's just one catch: that body can have no soul. Jumping into the body of a murdered royal Prime Vampire is everything a lost spirit on the vengeance trail could hope for. Princess Angelique Duprey, make that ex-Princess, has all the occult strength of the Damned plus a Prime's ability to manipulate the earth's elements. Just the sort of edge Tamsin needs to track a murderous band of Soul Eaters. Unfortunately, as a person, the Princess' only power seems to have been to piss people off. Dangerous people. The kind looking to start a lethal turf war with the Prime's clan for a cut of Chicago's Dark Side. Reanimating the body puts Tamsin right in the line of fire. But paranormal politics won't matter much if she can't convince the handsome Fae Hunter holding a knife to the Vamp's throat not to kill her all over again. This will keep you up into the dead of night! I'd recommend this to anyone who wants a fresh and entertaining take on vampires. The story grabs you from page one and you get swept away by the exciting action and engaging characters. This new vampire clan, the Primes, is really interesting. I also though Tamsin, the main character, was intriguing and likable. She has a lot of heart and soul for someone without a soul who is tracking a band of Soul Eaters (and a lot of cojones, too). The body jumping adds another twist to the situations. I'm hooked. Plan on reading this in one sitting. 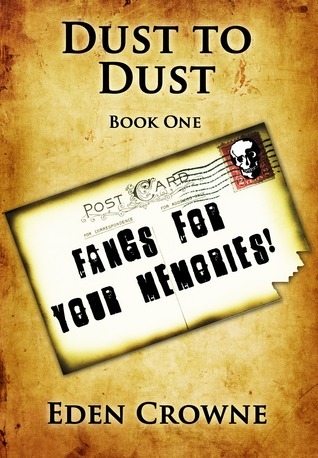 Dust to Dust: Fangs for Your Memories has everything you could ask for in an urban fantasy novel. Great characters, fast-paced action, clever dialogue and a really interesting new spin on everybody's favorite supernatural being, the vampire. I can't wait to see how these element-controlling vampires called "primes" will be developed in the future and how they will interact with the main character. I got this book because I saw that it was free ( at the time). I started to read it right away and found it was hard to put down. You get attached to the characters and the soul seeking thing makes for an interesting twist. This is a must read. I really enjoyed this book. I thought that the prime vampires were a fresh spin on the vampire genre, especially since they can use elemental energy. I look forward to seeing the primes develops and how their game plays out. The main character, Tasmin is really likeable, I thought the concept of body jumping was an interesting touch, it will make for some interesting sequels.